Some observations about social media in Albania. I’ve mentioned before how internet-savvy my little southeastern European host country is. Many of my Albanian colleagues and friends and even my students have cell phones with 3G capabilities, there is at least one internet cafe on every block, and everyone–and I mean EVERYONE–has Facebook. The world has progressed in such a way that if you’re not online, you miss out on a lot of interaction, and that’s particularly true in this country. My 9-year-old host brother has a Facebook, my 60-year-old counterpart has one, and some of my students even have multiple accounts. And I can’t even tease them about it because now I’ve got two accounts myself, and you’ll soon find out why. Posh Corps (n.): Peace Corps programs that are perceived to be “cushier” than the stereotypical Peace Corps experience, i.e. including accommodations such as running water, plumbing, electricity, internet access, etc. 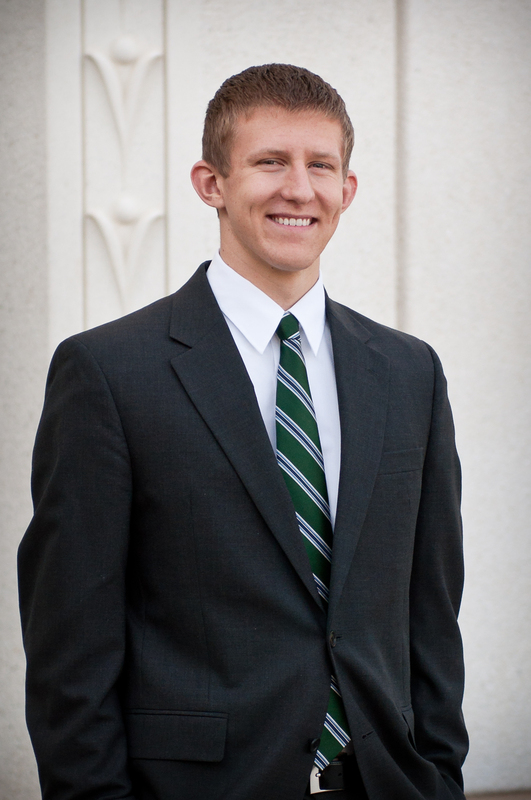 Serving under conditions of hardship. Here in PC Albania, we often joke about living in the “Posh Corps” whenever we’re out at a fancy café or hitting up the 3G on our mobile devices or enjoying the cool breeze of an AC unit in the summer. Part of it stems from a sort of irrational guilt; we know that in other Peace Corps countries, Volunteers are squatting in latrines or hand-washing their clothes until their knuckles are raw and killing their own dinner every night, so we’re made to feel as though we “should” be suffering more. I had my interview with President. Here are the highlights. 1. He said that I need to go on 30 dates, with 30 different chicks before I start steady dating. 2. That I should search for a job that the Lord would have me have, not that I myself should choose without his help (idk if I explained that well, but he had a point) 3. He said that he really admired the fact that I never quit. I thought that was nice =). And, I have a scripture for you: 3 John 1:13-14. We had a lunch together as a zone today. The ZL’s asked a waitress to take a picture of us afterwards. While the lady was taking a picture of us, I took a picture of her taking the picture of us while everyone was looking away… man, I’m so funny. Paniagua came to visit Calvario this week! 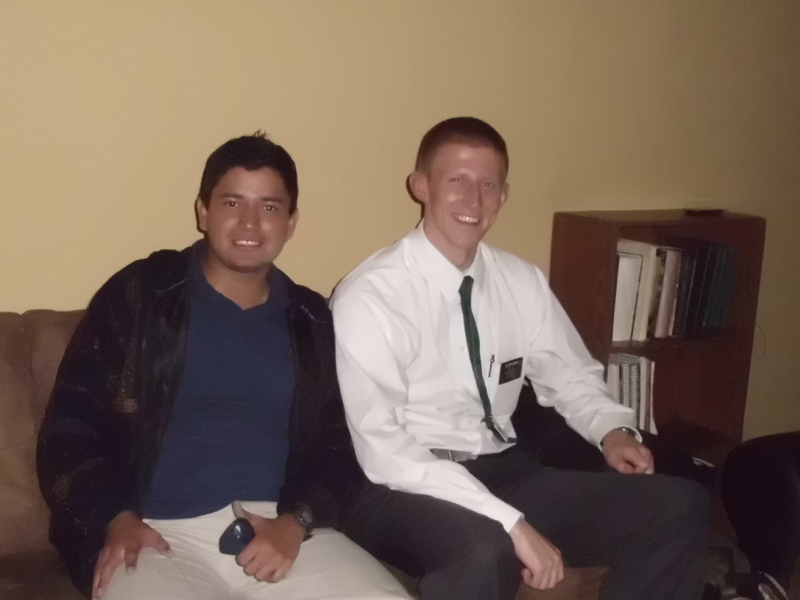 I got to talk to him for a bit this week. Another interesting note, I took the bomb!! 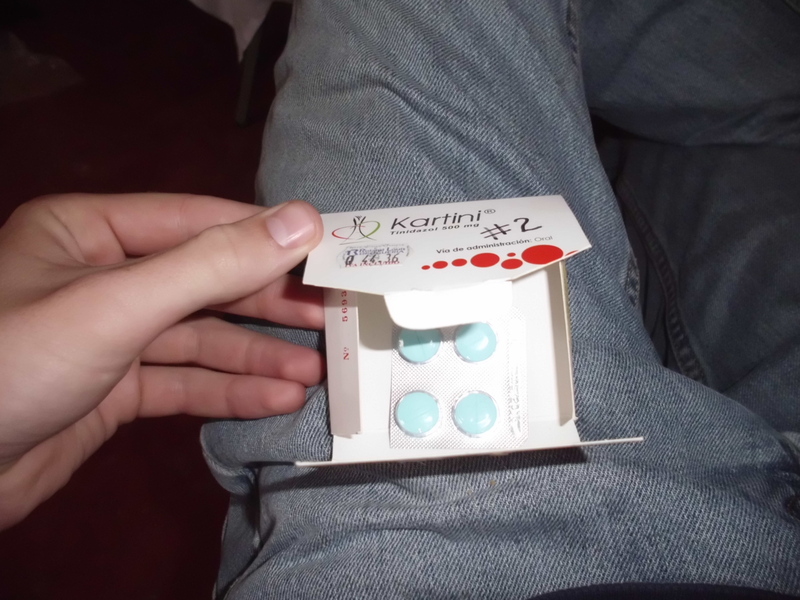 These 4 little pills had to be taken all at once, and once I did my guts started boiling, and bit by bit have been clearing me of all of the friends I have unwantedly acquired in my 2 years. 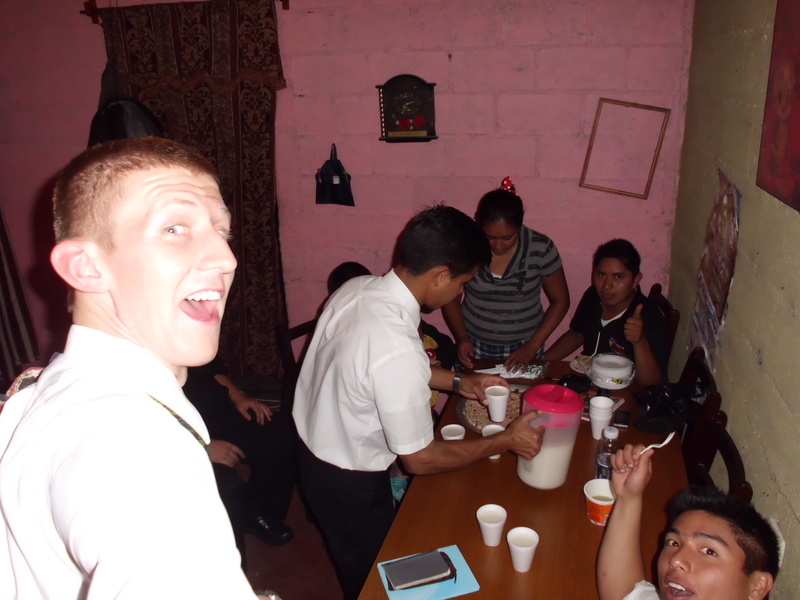 Here is another goodbye party that we had with our mission leader. A great guy. They made a cake and everything. Ima miss these folks. Ugh… just one more of these wretched p-days. I have finally admitted, Mom. I am going home. I am doing great though! We baptized!! 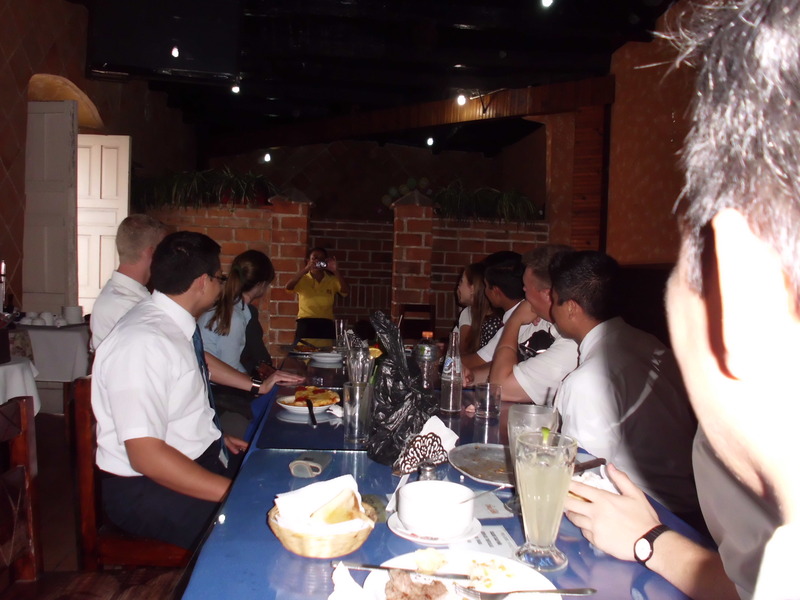 My last baptism… It was an awesome experience. He is 18 years old. He just naturally accepted everything we taught him, as if he had learned it from the pre-mortal life, and it had a familiar ring to him in this life. The other guy in the photo was the member friend who helped us. 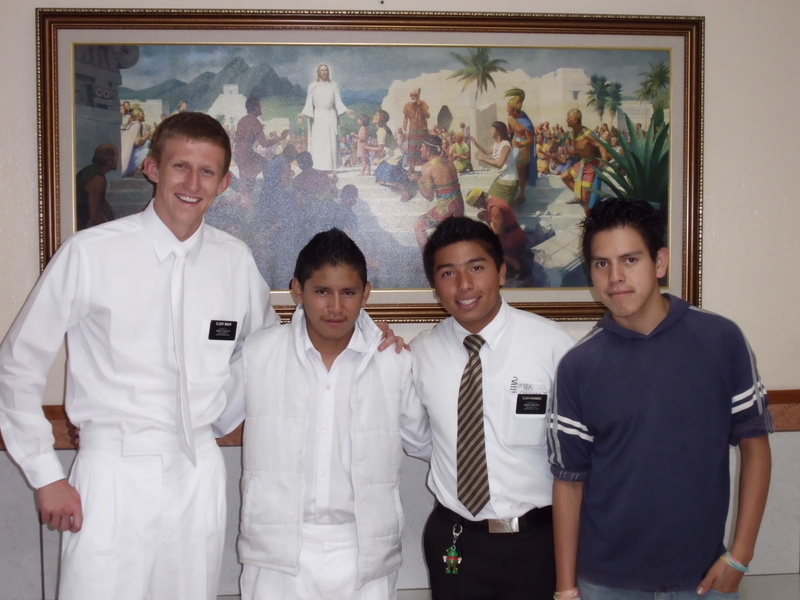 I got to baptize him. DAAA!!! Last time I will be dressed in white with a plaque on. 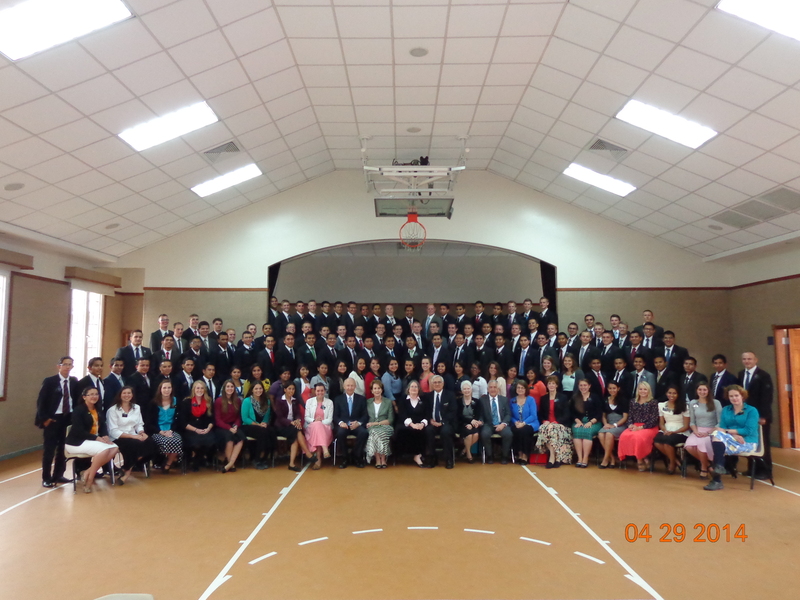 Here is a photo of when Elder Clarke was here. P.P.P.S. uh… this is only half of the mission though. They had another conference in Huehue before I got here. In other good news… I had a surprise party for when I had my 2 year birthday! 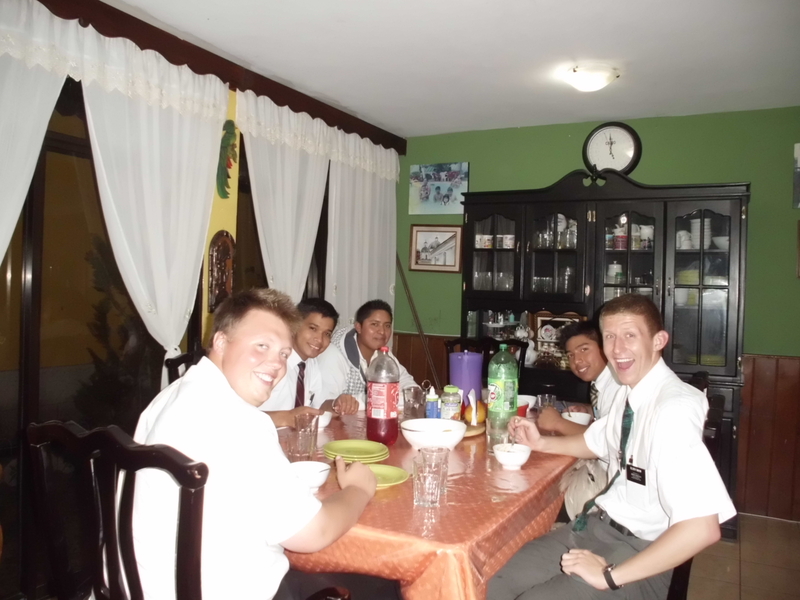 Elder Rodriguez and the other Elders secretly planned a Taco dinner for me in the house of a member on the 30th to celebrate. This member is the richest one in the area, so the tacos were actually really good. I have a good companion, and I share an area with some great guys. They also made me a wallet out of a Doritos bag as a gift. Cool beans. Dear Barbara, I have 1 week left. I can’t believe it. There is nothing else to do except work hard while I am at it. I love you, and I’ll see you soon. A while ago, my “10 Albanian Habits” post made the internet explode. Well, at least amongst English-speaking Albanians around the world. Never did I expect that a post I wrote so quickly and innocently would become such a big deal, and even result in changing my life. I got plenty of feedback on this article, and luckily, lots of people really seemed to enjoy it. There was a minority who called me names and demanded that I leave the country in the comments section, but luckily I’ve developed a bit of a thicker skin since serving in the Peace Corps. Hey!! 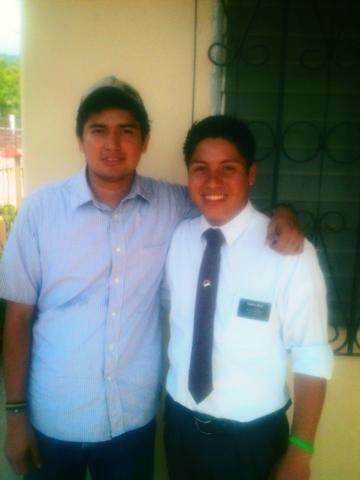 A fun little update… Paniagua saw my first convert Josue last week as a missionary! 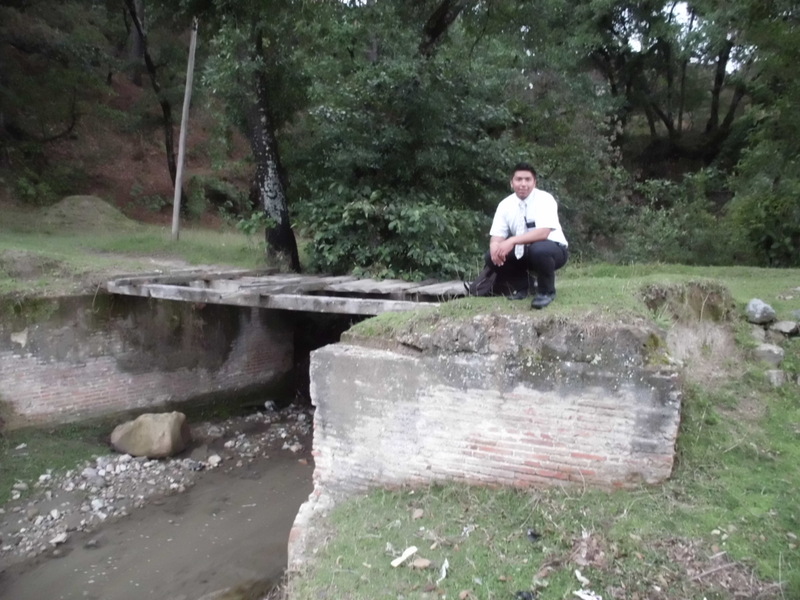 Josue is serving in Honduras right next to where Paniagua is… here is a photo he sent.